Ajuba a preteen Ghanaian girl was registered, perhaps abandoned in a boarding school in a faraway rural England. Far from all that was familiar to her. Her mother, mentally unstable suffered from recurrent hallucinations. While her father who couldn't put up with the continuous crisis in his marriage, gave up. In the boarding school, Ajuba met Polly Venus with whom she became best of friends. They spent holidays and weekends together in Polly's house, like the one you can picture on the book cover. During Ajuba's stay with the Venus, she found out that they weren't as glamourous as one might think from the outside. After all, they were weirdly similar to her own family. From experience she knew it was only a matter of time before they split up. And they tragically did. Luckily, her relationship with Polly did not alter in course of their misfortune, instead new bond of friendship was formed. 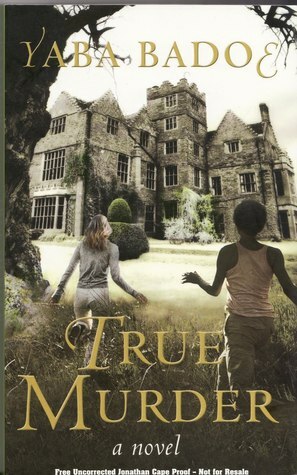 "True Murder" was exquisitely and mysteriously written with credible characters. Like a diary, Ajuba narrated her emotional agitation of experiencing her parents separation and the tragic break up of her best friend's family. In addition, it is a novel somewhat difficult to classify, as in whether or not it is an African literature due to its multifaceted nature. However, I was left slightly disappointed since I was expecting a similar storyline to "The Rival" in African Love Stories by same author. Moreover, some adults might find it a bit YA fiction; nonetheless, they should not be discouraged because if they have read and enjoyed Purple Hibiscus by Chimamanda Ngozi Adichie, Powder Necklace by Nana Ekua Brew-Hammond, Imagine This by Sade Adeniran they might as well like True Murder. Therefore, I recommend. You made the book sound so intriguing when you said it was 'exquisitely and mysteriously written.' The cover is lovely. Yeah it was, there was a "murder case"... it was quite intriguing. Might be a spoiler if I give the whole detail. I love mysteries and this sounds a little different than the ones I've been reading lately. Thank you for the recommendation - I'm adding to my TBR wish list. Debbie... if you love misteries.. you would enjoy this one. From your review, I think the author has done a great job by creating something interesting and mysterious. Nice work Mary. Will add it to my list of books to read. You know we authors also have to read a lot. I believe that a wonderful author is one who reads wonderful books. Karo this novel was very well written. Actually, it is a novel I wholeheartedly recommend to anyone aspiring to be a good writer. Pls read it anytime you have the chance. YA Lit is good fiction too. You are spot on. But you know at times some grown up adults might think YA Lit is not made for them. Sounds like an intriguing read. Actually I've heard quite a few words about this book. Would love to read it. Nice review, Mary. Yaba, Thanks to you for taking your time to stop by. Sure, I will post your latest film project on my twitter and facebook page. That is quite impressive.